WhatsApp users can now add their own custom Christmas sticker packs and send them to friends and family. WhatsApp stickers, which were launched last month, have become popular quickly. During Diwali and Kerala Piravi festivals, custom stickers as well as those in regional languages like Malayalam were an instant hit. Now, anyone can send sticker pack and add to WhatsApp, thanks to ‘Christmas Stickers for WhatsApp’ Android app. This is possible as WhatsApp has added support for third-party sticker packs as well. 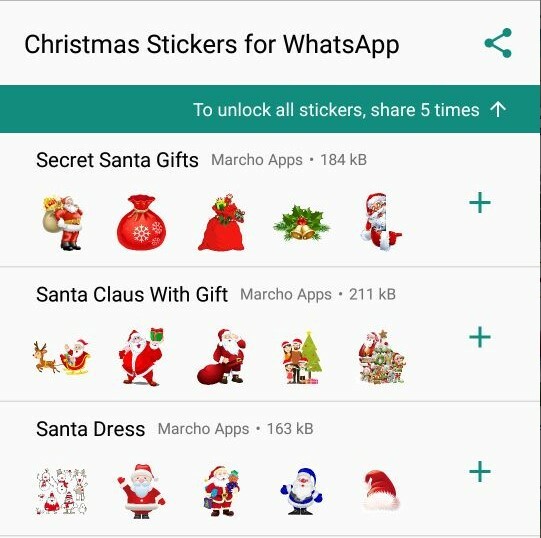 To send sticker packs, Android users will need to download the ‘Christmas Stickers for WhatsApp’ app from the Google Play Store. Once the app is downloaded, click on the “Sticker pack you like to add” option and it will directly add stickers to your WhatsApp. However, the icon on top will be the tray icon or the icon which will appear as an identifier for you sticker pack in WhatsApp. Do note that the tray icon will appear as a sticker. Now, click on ‘add, it cannot be cropped to select the portion one wants as stickers. Once done, it will be added as one of the stickers in your sticker pack. One can add up to 6 stickers in one sticker pack. However, the flip side is you will need to add all stickers packs at once as the pack cannot be edited once published on WhatsApp. You can publish with lesser stickers also, but cannot add more to the pack upon publishing. For instance, I published my sticker pack with four stickers and to add more of my own stickers on WhatsApp. Also the app is not premium, if you want to access to all the stickers available, only you have to share app with 5 friends and it’s done. Finally, click on ‘Publish Sticker Pack’ option at the right corner to publish. The sticker pack will automatically get added to WhatsApp and only you will be able to send these stickers across to your contacts and friends. Your sticker pack in the app will be identified with the tray icon that you added at the beginning. To the recipients, the stickers you send will appear with the sticker pack’s name as well as author and they will be able to forward this to their contacts. Looking to Hire website development company for your project? Saturncube Technologies is the leading website and mobile app development company with experience of more than 8 years in the development.